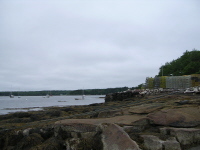 Cundy's Harbor is located at the very tip of Great Sebascodegan Island in the Town of Harpswell. This quaint little Maine fishing village is a delight to see. It is a short drive from Brunswick, Maine just off Route 24 (20 mins). It is a working fishermen's harbor. There is, for the occasional tourist, a souvenir shop, general store, and restaurant selling sandwiches, drinks, and fish dinners. 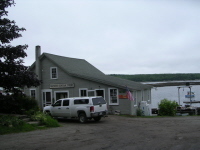 Cundy's Harbor is a very small but active commercial fishing harbor. It was established in 1727. Read about the pirates of Cundy's Harbor! 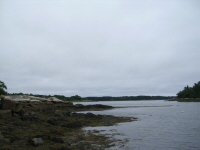 Cundy's Harbor. Stop for the view, take some pictures, buy some gifts, get something to eat. Nice place to spend an hour or two and a pretty drive getting to this location. Just minutes off Route 24 on Great Sebascodegan Island. "Lobsters, clams, and a varied selection of gifts"
Bethel Point. 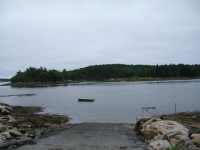 A small boat ramp (you need a town permit to park although there is a boat storage area that may allow you to park there). Good views of Hen Cove and Quahog Bay, and Yarmouth Island. Located at the end of Bethel Point Road. From I-285 take the Topsham exit. Continue on to Route 1. Take the first exit at Cooks Corner. Take Route 24 South. It is about 12 miles south of Brunswick / Topsham area. Once on Great Island - take the left at the sign that says "Cundy's Harbor". Holbrooks Wharf and Snack Bar. (this place also has the only rest room facility around). "Lobstering Village Serves up Central-Coast Delights", High Adventure.com. "New gallery's art mirrors a village come back to life", Portland Press Herald. "Gunkholing with Gizmo: Cundy's Harbor". 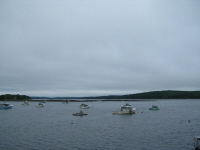 Maine Boats, Homes & Harbors.